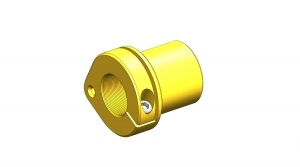 This collet is for use with 3/4-40tpi (RESS3440-32) Radius ended set screw. It is designed for heavy load, up to 3000 pound axial loads. The load must be applied against the flange. The collet may be bonded in or secured with the flat head screw as shown on the flange. Do not press this collet into place as it will distort the precision thread.